Escape the city and enjoy the Cowichan Valley’s wine, food and outdoor scene. Visit the Farmer’s Market for locally-grown organic produce or crafts, spend an afternoon touring local wineries or visiting Canada’s only tea farm. Visit the Kinsol Trestle, meander along the Pacific coastline or hike through enchanting west coast forests, possibly catching sight of our many birds and wildlife. Spend your evening doing an impromptu BBQ, sipping on our award-winning wines and waiting for the sun to set over the slopes of the vineyard. Enjoy your “Bed & Bottle” retreat among the vines. 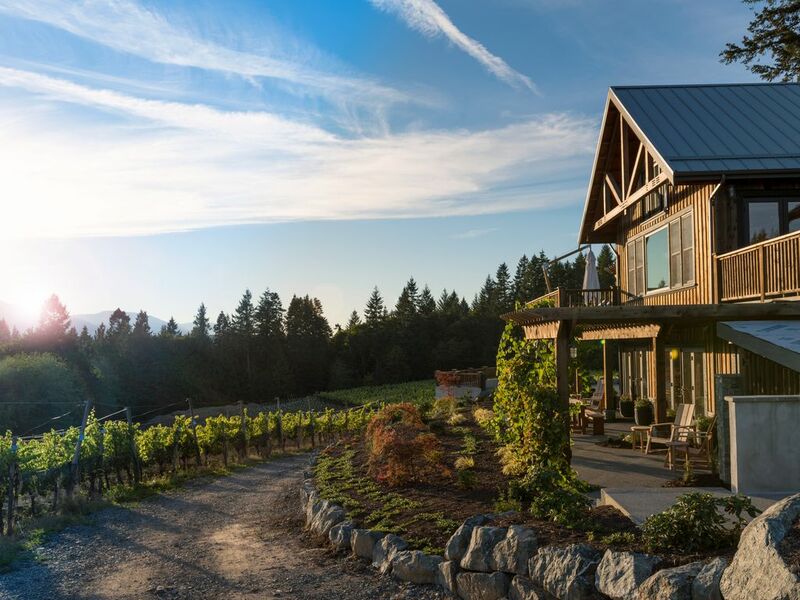 Relax and enjoy the surrounding vineyard while absorbing the natural serenity; or drive a short few minutes to the unique and historic waterfront community of Cowichan Bay. The Grouse House’s two-bedroom suite sleeps four, ideal for two couples or a family. The modern and well-appointed kitchen is the perfect place to make the most of your farmer’s market finds. A panoramic outdoor patio features a barbecue and ample space to sit, relax, and enjoy a glass of wine. It’s the perfect spot to enjoy your “Bed & Bottle” service: one bottle of wine is our gift to you on check in. Hold your wedding in this spectacular location, then stay the night to start your honeymoon right. The Grouse House decor is decidedly rustic-modern with natural wood floors, chef's prep island in the kitchen and a harvest dining table that seats at least eight. With two large bedrooms, each with its own luxurious en-suite bathroom and a large, comfortable great room with fireplace, full kitchen and stellar Cowichan views, this is a perfect hideaway rental for wine lovers, wedding parties, couples retreat or the ideal location for that long overdue girls weekend away. The Grouse House is one-of-a-kind, allowing you to wake up to the sights and sounds of the vineyard. With its convenient location in the Cowichan Valley, visitors looking to explore the area will leave the Grouse House refreshed, and return to a peaceful place to rest. Once the preferred habitat of Blue Grouse, the 45 acres of Blue Grouse Estate are tucked away on a sunny slope of Vancouver Island’s Cowichan Valley, which is believed to take its name from a First Nation's word meaning "the warm land". A fitting name, as the valley enjoys Canada’s warmest mean temperature. The terroir encompasses wind protection by evergreen trees, an all-Southern exposure, a combination of clay and gravelly soil, and the nurturing of pure air and spring water. Thanks to this exceptional site, the vines require little fertilization and irrigation, just a drop of passion, a splash of dedication and hard work, and a pinch of obsession make the difference! A luxurious and unforgettable Cowichan Valley retreat. Coffee, flour, sugar, olive oil, vinegar, non-dairy creamer, a few spices, salt and pepper. One bedroom is dedicated with an accessible bathroom - including a zero threshold shower, a vanity that allows for knee space, adequate transfer space at the wc as well as grab bars. Our new favourite place for a City break. Lovely setting, beautifully appointed. A perfect pastoral retreat. Grouse House basked under a full moon during our visit and we heard owls in the vineyard throughout the night. A magical exprience! We enjoyed our two night stay - very luxurious and relaxing lovel cool house to escape from the heat of the day. Extremely comfortable. What a beautiful setting and a fabulously comfortable place to stay for the weekend. Well worth it and everyone so friendly too. You think the inside is gorgeous until you see the view! We stayed at the Grouse House over the weekend during the BC Summer Games. Located right in the winery you couldn't ask for a better view from the king size bed in the master bedroom. They have thought of every little detail to make the stay more enjoyable along with a lovely bottle of wine in the fridge upon arrival! Melanie was extremely helpful and the location was central to many things. We would absolutely stay here again if we were in the area. I would highly recommend it! A lovely property, in a lovely location! Relax and enjoy the surrounding vineyard while absorbing the natural serenity. Visit the Blue Grouse Tasting room for a wine tasting, picnic lunch or to enjoy a glass of wine. Rates are displayed in USD. Please be aware we are located in Canada and charge CAD. Check Rates on our page. Rates are subject to change until rental is confirmed.